Amarpreet Sawhney, Ph.D., was elected as Executive Chairman of the Board in July 2017. Since co-founding the company in 2006, he served as President and Chief Executive Officer until 2017. Dr. Sawhney was also the CEO of Augmenix, an affiliate of Ocular Therapeutix, from 2008 until April 2014. In addition, he is a general partner of Incept, LLC, an intellectual property holding company. Previously, Dr. Sawhney founded Confluent Surgical and served as its President and CEO prior to its acquisition by Covidien plc. He also was a technology founder of Focal, Inc., a biopharmaceutical company acquired by Genzyme Corporation, and a founder of Access Closure, Inc., acquired by Cardinal Health in 2014. 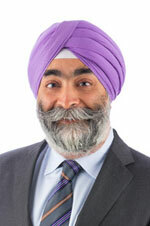 Dr. Sawhney’s innovations are the subject of over 100 issued and pending patents. He holds M.S. and Ph.D. degrees in Chemical Engineering from the University of Texas at Austin, as well as a B.Tech. in Chemical Engineering from the Indian Institute of Technology, Delhi India.